Found while doing the normal weekly walkaround of the BICS Construction project, the tail end of a dog was sticking out of a hole in the pile of black dirt along the fence on the Kings Highway. The dog was barking at something and digging into that pile of black dirt. Ignoring the dog, this photographer continued on down to take a couple more pictures, and without warning, the dog came out carrying this animal. Dumbfounded, not one picture was taken of the animal in the dog's mouth, but these pictures were taken after the dog brought the woodchuck out. 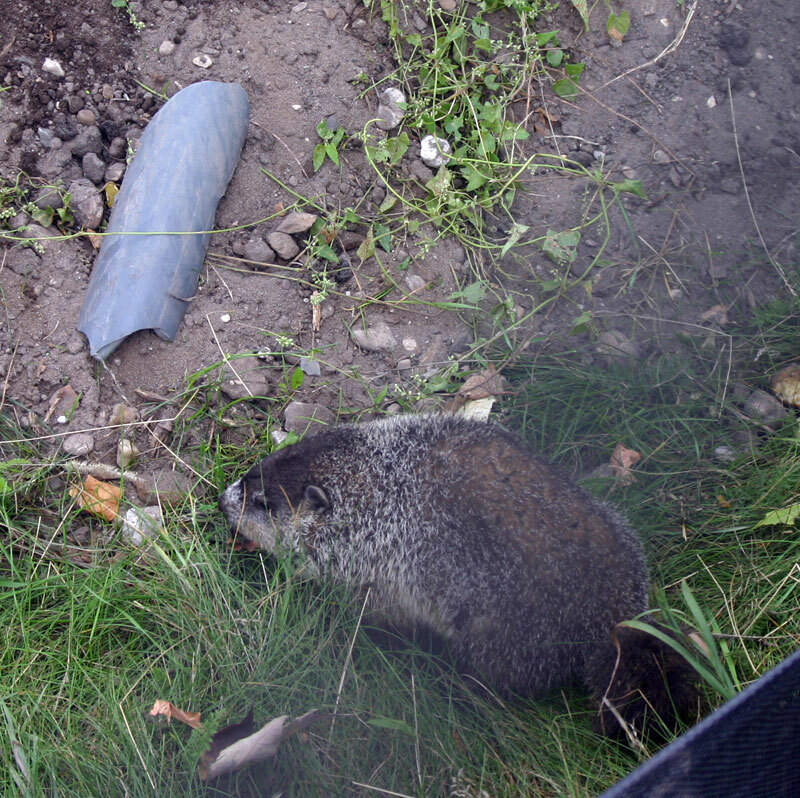 The woodchuck decided to play dead, whether it was exhausted from a fight or just an inherent protective mechanism, and this picture was taken. 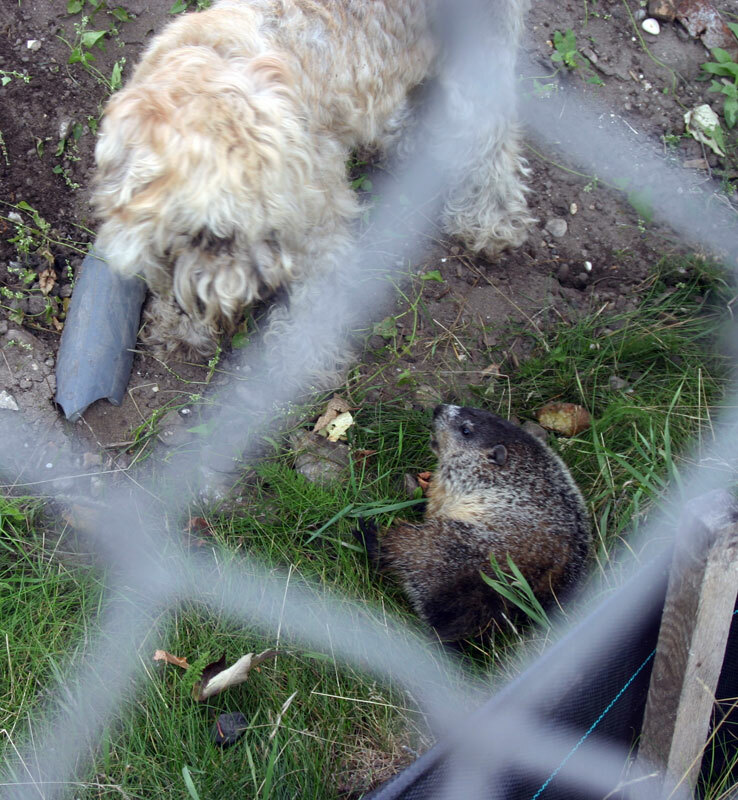 The dog just stood there and stared at the woodchuck who was not moving, and finally, the dog moved away, seemingly bored with the situation. Gathering its wits about itself, the woodchuck opened one eye to look to see where the dog had gone. It did not see the dog, and the dog did not see the woodchuck. After about five minutes, the woodchuck shook itself and managed to crawl back into the hole in the side of the hill of black dirt. This added a little excitement to the BICS Walkaround this week. Where was the video camera when it was needed? The answer is that it was back in the car in the camera case where it was left when the walkaround began. This would have made a really cool video clip to put on this website, but it just wasn't meant to be. 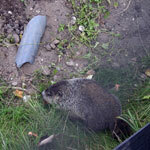 Here is some more information about woodchucks. The name Woodchuck comes from a Cree Indian word, wuchak, used to identify several different animals of similar size and color, including other marmots; it denotes nothing about the Woodchuck's habits or habitat. This sun-loving creature is active by day, especially in early morning and late afternoon. 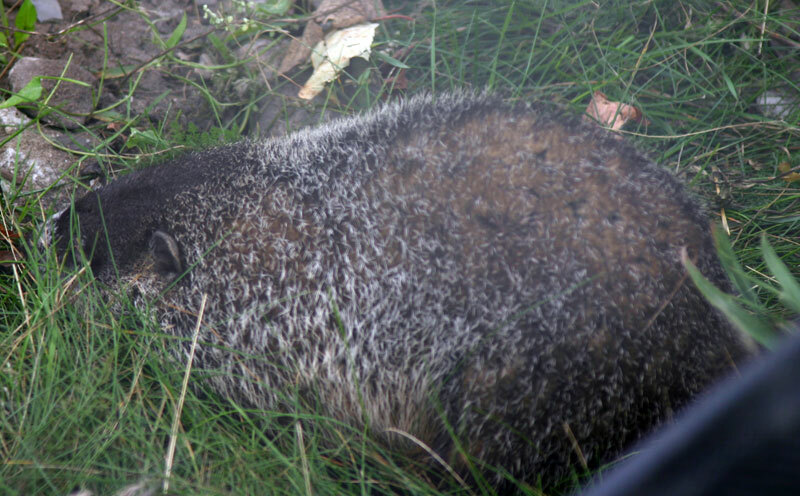 In late summer or early fall, the Woodchuck puts on a heavy layer of fat, which sustains it through hibernation. 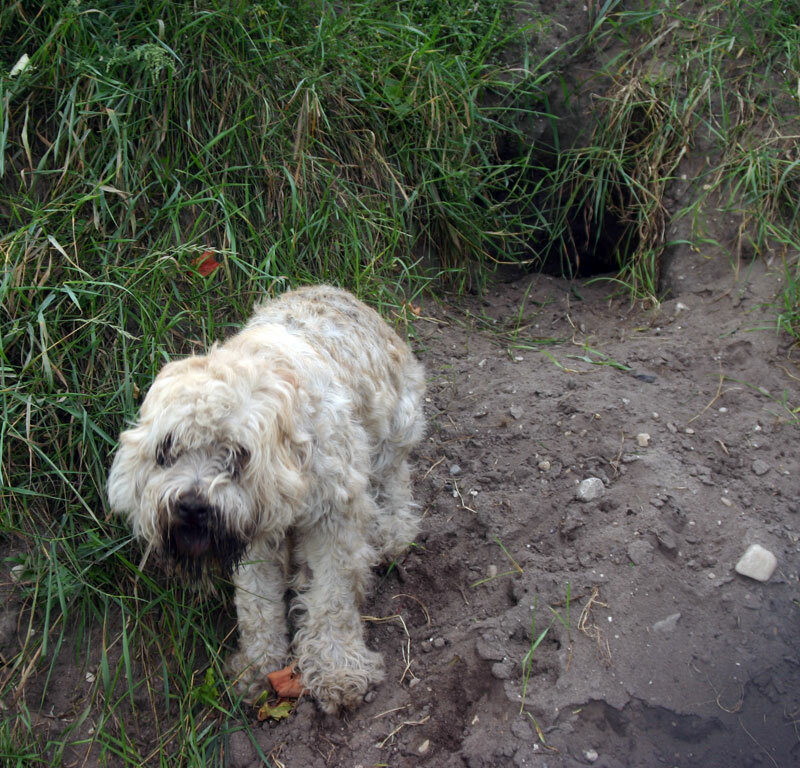 It digs a winter burrow with a hibernation chamber, where it curls up in a ball on a mat of grasses. The animal's body temperature falls from almost 97°F (36°C) to less than 40°F (4°C), its breathing slows to once every six minutes, and its heartbeat drops from more than 100 beats per minute to four. The Woodchuck emerges in early spring (according to legend, on February 2, Groundhog Day, but much later in northern parts of its range). A male at once seeks a mate; its brief stay in the burrow of a receptive female is almost the only time that two adults share a den. A good swimmer and climber, the Woodchuck will ascend a tree to escape an enemy or obtain a vantage point, but never travels far from its den. Its burrow, up to 5 feet (1.5 m) deep and 30 feet (9 m) long, has one or more tunnels terminating in a chamber containing a large grass nest. Other mammals, including cottontail rabbits, Virginia Opossums, Common Raccoons, skunks, and foxes, may use a vacant Woodchuck burrow, sometimes enlarging it to create a nursery den. Green vegetation, such as grasses, clover, alfalfa, and plantain, forms its diet; at times it will feed heavily on corn and can cause extensive damage in a garden. If alarmed, the Woodchuck often gives a loud, sharp whistle, followed by softer ones as it runs for its burrow, from which it then peeks out. When agitated, it chatters its teeth, and it can hiss, squeal, and growl. The human hunter is the Woodchuck's major enemy, but the automobile and large predators, especially the Red Fox, also take their toll. While an overpopulation can damage crop fields, gardens, and pastures, Woodchucks are beneficial in moderate numbers. Their defecation inside the burrow, in a special excrement chamber separate from the nesting chamber, fertilizes the earth. Their digging loosens and aerates the soil, letting in moisture and organic matter while bringing up subsoil for transformation into topsoil (in New York State they turn over 1.6 million tons of soil each year). description A large marmot. Grizzled brown (with variations from reddish to blackish); uniformly colored. Prominent bushy tail. Small ears. Short legs. Feet dark brown or black. Incisors white. L 16 1/2–32" (418–820 mm); T 3 7/8–6" (100–152 mm); HF 2 7/8–3 7/8" (75–100 mm); Wt 4 1/2–14 lb (2–6.4 kg). This material provided by eNature.com .